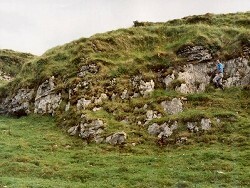 Type locality of Carrickmacsparrow Limestone Member (Dartry Limestone Formation), west facing low cliff in Carrickmacsparrow Townalnd, 1 km SW of Lough Nagor, Co. Fermanagh. The distribution of rocks is normally established by mapping them across country. Good, accurate mapping requires rocks that are easy to characterise and recognise while walking the landscape. The Carrickmacsparrow Limestone Member is one such rock. It is a valuable marker horizon in a considerable thickness of the chert rich Dartry Limestone Formation. In its type area (the area in which it is defined), it consists of 4m of pale grey to pale brown, recrystallized, fine-grained limestone and large grained limestones containing crinoid ossicles (segments of stems and tentacles) and recrystallized pellets of biological origin. It has no bedding planes but contains many horizontal saw-tooth partings called stylolites caused by the calcite of the rock dissolving under high compressive stresses. It stands out clearly from the Dartry Limestone above and below because of the absence of bedding planes and chert. The Carrickmacsparrow Member is thought to have formed in a relatively shallow marine environment, just above the zone disturbed by the passage of waves. In this zone water movement carries off fine sediment and the particles remaining are tumbled and rolled back and forth, settling and supporting each other. The spaces between them eventually fill with calcite cement. Some structures, such as channels carved into the lime sediment and small scale current bedding, suggest shallower water still, possibly even shoals. The Carrickmacsparrow Limestone Member is a clear indicator that the top of the Dartry Limestone Formation is not far above. It occurs on Belmore Mountain and has an equivalent at the same horizon on Cuilcagh Mountain. It also indicates a phase of extremely shallow water across the basin in which the Dartry Limestone formed about 335 million years ago. This outcrop, in Carrickmacsparrow townland, is its stratotype (see glossary) and consequently should be designated and protected for future scientific comparison. There are no immediate threats to the site.